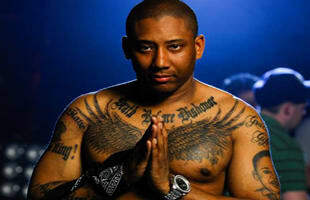 Maino is an American rapper from Bedford-Stuyvesant, Brooklyn, New York City, New York. Maino is best known for his song Hi Hater. Maino has NYC on his back for a little bit, we will see what he does next. Uncle Murda Recruits Raekwon, Maino, Troy Ave, and Tank To Give NYC "What They Want"
Maino Puts Brooklyn on his Back, Drops the Video for "5 More/Brooklyn We Take It"
Maino and Trinidad Jame$ Speak on The Phone, But Is the Beef Over? Listen: Maino f/ Raekwon & Robbie Nova "Bet That"
Listen: Maino f/ Jadakiss "What Happened"
Listen: DJ Naim f/ Gunplay, Jim Jones, Maino & David Rush "Crispy Hunneds"
Listen: Maino f/ Yo Gotti "One Bad B*tch"